My coast-to-coast-to-extreme coast journey taught me a few things: I love the Maritimes (particularly St. John’s Newfoundland and Labrador), I am a much better flyer than I was a few years ago (not completely freaking out when getting into a small plane in stormy weather), I’m still capable of travelling alone, but I prefer travelling with Tom, and there is no place like home. It all started with flying to St. John’s. I was at the airport pretty early on a Sunday morning, even with that I wouldn’t be in St. John’s until 9:40 their time. I paid for an upgrade to ‘Plus’ on WestJet and yeah there was some additional leg room alright and some ‘free’ food and drink, but I found I really didn’t need it that badly. 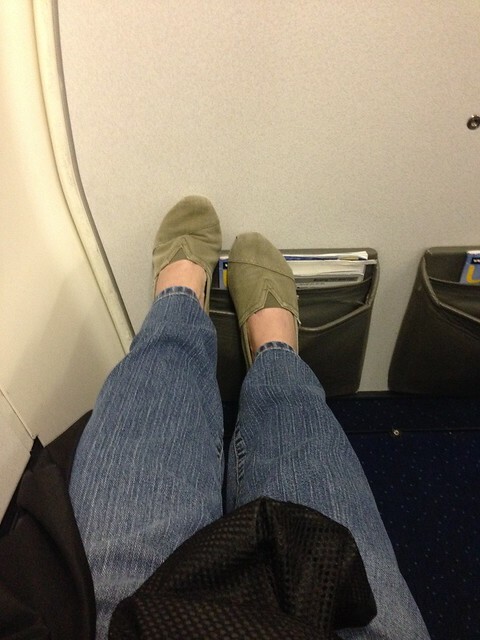 Unlike Alaska you don’t get the nice wide boofy seats in first class so I took a pass on the other legs. Is it possible to fall in love with a city at first sight? Well second technically as I arrived in the dark and didn’t interact with THAT many people until the following day. But fall in love I did. 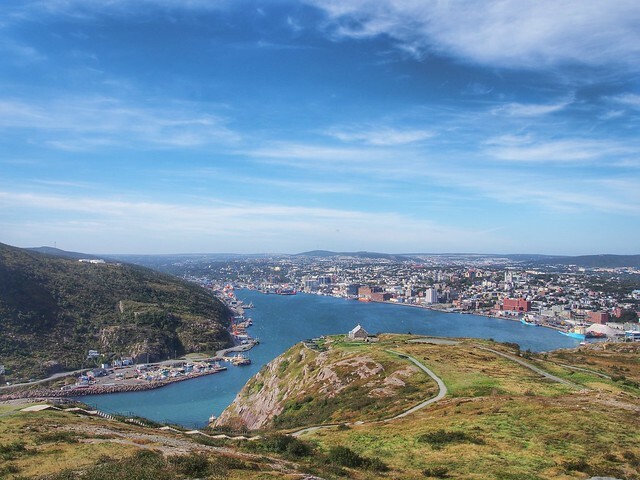 I cannot say enough nice things about the people of St. John’s. The accent? LOVE IT. The architecture? Two words: Jelly Beans! Colourful Victorians out the wazoo. You can practically throw a rock and hit a restaurant or a bar on any main drag, on George street you don’t even need to throw a rock. The cabbies are full of stories…did I mention I love the people? I was lucky enough to spend 5 nights there and work with some fabulous people. 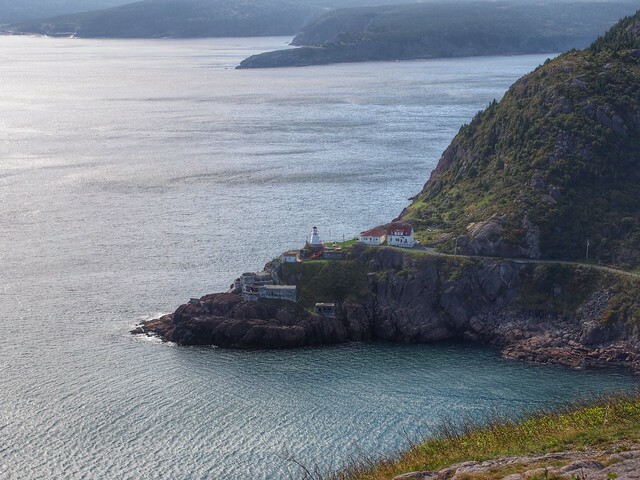 My last full day, I was encouraged to take a couple of hours (I wasn’t needed in the morning) and walk up Signal Hill. I was staying on Duckworth street not far from the start of the walk uphill. It was a somewhat steep climb (most people drove!) but it was worth it. The views of St. John’s were amazing. At first I was pretty much alone to enjoy it. Then a few busloads of people arrived. The flooded the area, including the inside of the tower, but they didn’t stay long. The crazy winds drove them back to the safety of their bus. I stayed for quite a while, snapping pics and enjoying the view. I took a bit of creative license with this pic of the tower, it has a radio antenna on it I found kind of ruined the look so I photoshopped it out. 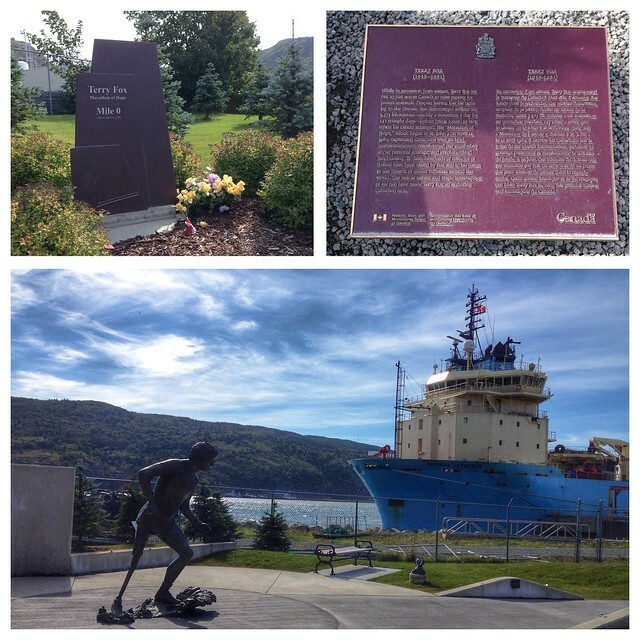 On my way back, despite being tired from that hike up the hill, for some reason I was drawn to the waterfront and completely by accident happened up on very special spot, mile zero of Terry Fox’s ill-fated cross-country journey to raise money and awareness for cancer research. As a west coaster and someone who had watched Terry’s journey on the news it was special and humbling to see, considering I was feeling tired and internally grumbling after my walk. This young man ran a marathon a day on one leg. Perspective. 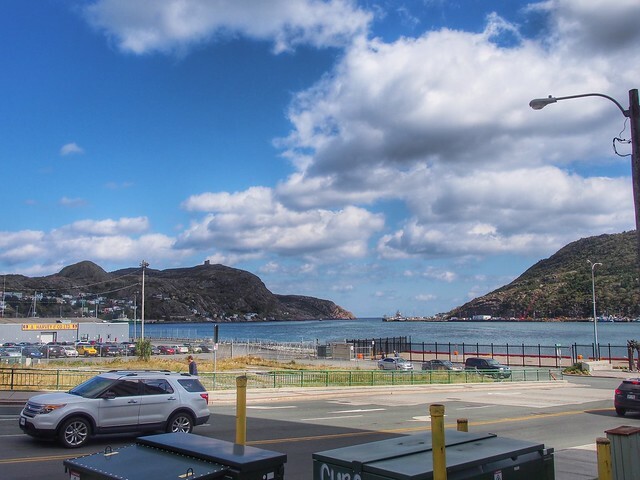 As it was a work trip, I didn’t have a lot of time to take pictures, but I took the most of St. John’s. I was told that in June you can watch icebergs float by through the harbour and sometimes they get stuck there. How cool would that be? I regretfully left on Friday morning. 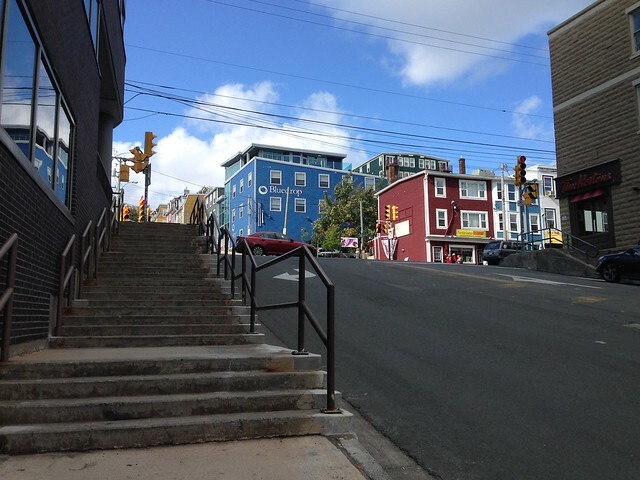 I really should have spent my weekend in St. John’s, but everyone said I should spend my free time in Halifax. Not that it wasn’t great, it was and there were plenty of places I wanted to see in Nova Scotia, but I didn’t have a car. 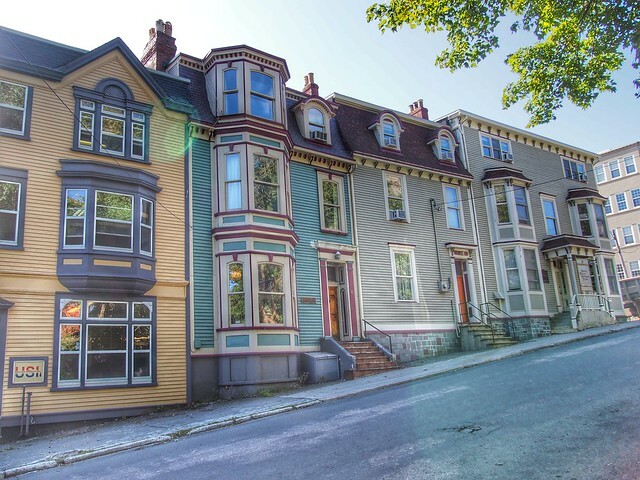 I just loved St. John’s a little bit more. Lots of history in both places, in Halifax it was very much mixed in with modern surroundings like this old cemetery which is now a park. 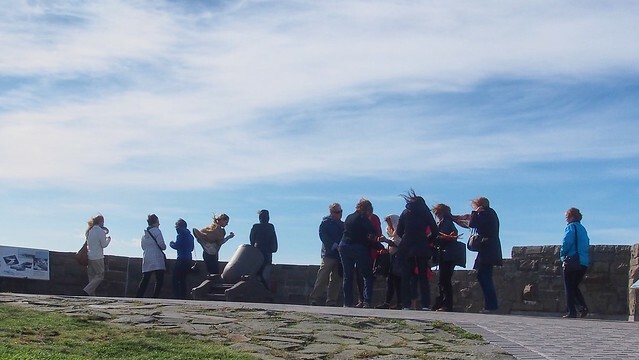 The people in Halifax were also lovely and friendly, especially the folks I worked with. The seafood in both cities was beyond great. I made the mistake of taking a break from seafood and going to what was pegged as the best Chinese restaurant in Halifax. Coming from someone who has had GREAT Chinese food, that wasn’t. Lesson learned! I moved back to seafood. 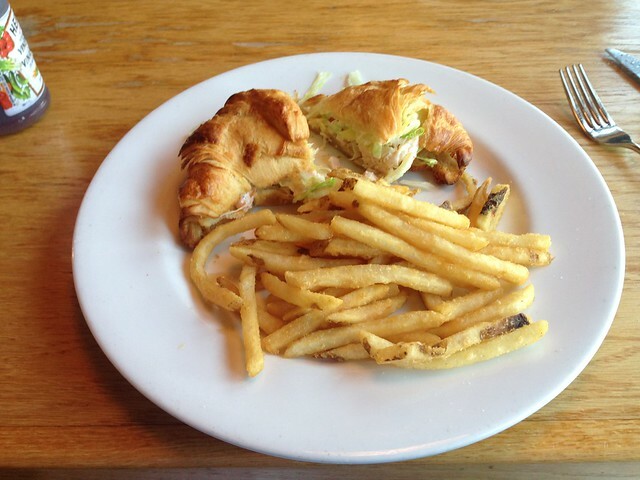 Ever in Halifax I highly recommend the lobster croissant at Salty’s mmmm.. 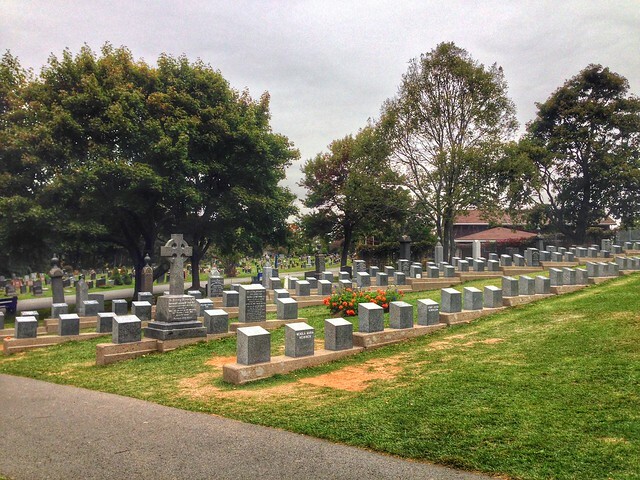 I found out that 121 souls from the Titanic were buried in Fairview Cemetery walking distance from where I worked the first part of the week so before heading ‘home’ to my hotel I wandered down after work. There is a whole section clearly marked for visitors to find. 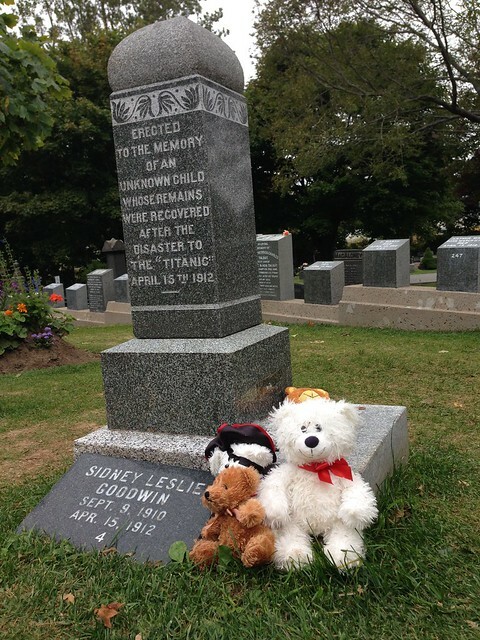 Particularly poignant was the gravestone for the unknown child who was it turns out later identified. 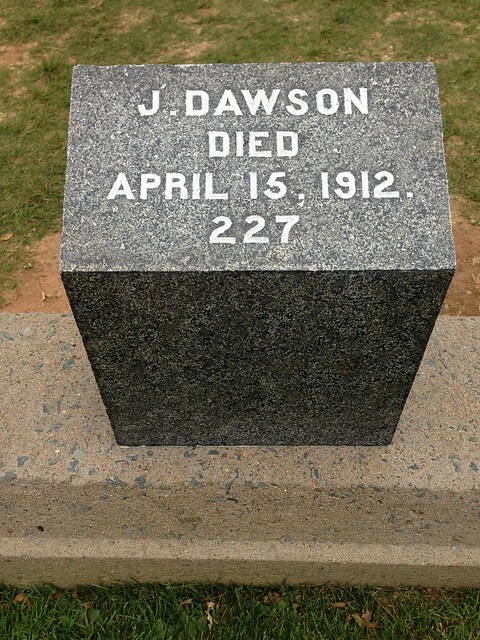 I had also read that a gravestone for a J Dawson is often adorned with flowers and the like from people who believe the character Jack Dawson from the movie Titanic was real. It was free from decoration when I was there though. It was sad to see so many gravestones with the same date repeating one after another as I walked the rows. Sadder still to see the graves with no name, only a number. After the two weeks away I was due for a weekend home before I flew to Haida Gwaii (up the coast of BC, Google it). I was at the airport the requisite amount of time before my flight, made it all the way to my seat and to where the flight attendants start with their safety spiel when the captain came on over the speakers to inform us that some kind of indicator light was on which shouldn’t be, so maintenance would need to be called to inspect. We sat in our seats on the tarmac all silently hoping that it was a false alarm and we could get underway. That is until he came back on and said that there was indeed a problem and that we’d all have to get off the plane and wait to see if it was something they could fix. Those of us with connecting flights fretted. Mine was a reasonable turn around but as time went by, that window shrank. Eventually they came on over the loudspeaker to announce our flight was cancelled, to go get our bags and head back to the check-in counter as the West Jetters were busily trying to find us alternate flights to our destinations. After standing in line for what seemed ages one of the reps asked if I was travelling alone. 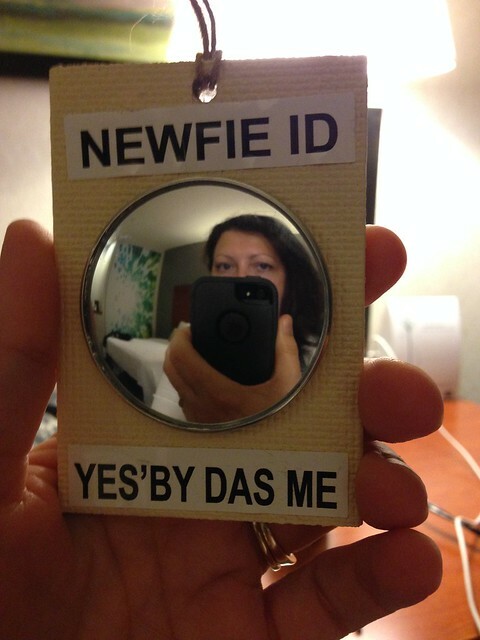 I said yes (with slight confusion), but it turns out she wanted to see if I had already been booked on a flight. She offered to check on the kiosk for me (using my original reservation code) so I wouldn’t lose my place in line. I was lucky, even though I was booked for a stopover in Toronto, I didn’t HAVE to land there so I had more alternatives. People actually flying to T-Dot in some cases weren’t going to see it until the next day. It turned out I was booked on a flight that touched down in Hamilton and then flew to Calgary where I would switch planes and so she went ahead and checked me in. I thanked her for her help and ran straight for the baggage drop area, she came and found me and handed me a meal voucher. I headed right back through security as my flight was due to take off in an hour. Once there I found out my flight was, you guessed it, delayed! This put my last connection in Calgary at risk. At that point if I missed it, there was one last flight they could book me on, but that would put me in Vancouver after midnight, as it was I was already going to be there after 11:00 pm already 5 hours later than originally scheduled. I thought I was never going to get to go home! Eventually though the plane arrived and I was sat in the middle seat (boo!) but grateful to be jetting closer to home. We touched down in Hamilton and my two seatmates were replaced by a nice couple with a baby. They asked if I wouldn’t mind if they sat together and I gladly moved over. We chatted for a bit, I played silly faces with the baby and they found out about my long long long day and the possibility I may still miss my connection. They offered to jump out of their seats and let me in the aisle first once we hit Calgary to give me a better chance to catch the connection which was really sweet of them. I took them up on it and when we landed ran straight for the gate. That flight was just boarding when I got there thank goodness. I sent Tom a message to confirm I was on the flight so he’d know when to go to the airport to pick me up. I cannot even express how grateful I was when I finally landed at YVR and saw Tom. Man I missed him sooo much, we haven’t been apart that long since we were finally living together! Geez this post is already getting too long, on to Haida Gwaii next time. 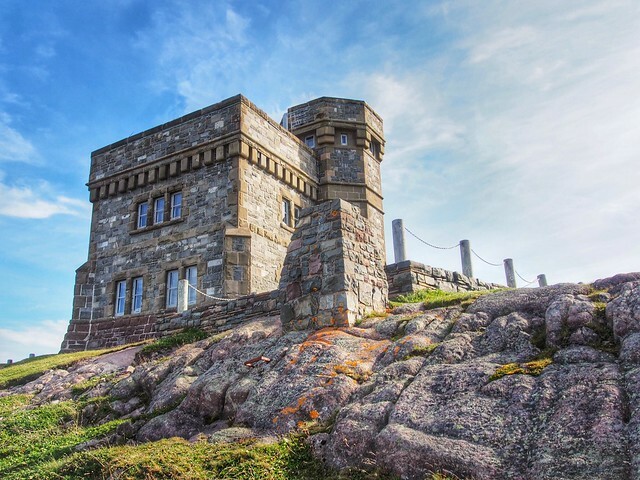 This entry was posted in travel and tagged Halifax, Maritimes, Newfoundland, Nova Scotia, St John's, travel. Bookmark the permalink.